Aurelia® Transform™ Long-lasting comfort, durability and decreased hand fatigue. Transform® offers improved barrier protection while mimicking the slim fit and comfort of a latex glove. 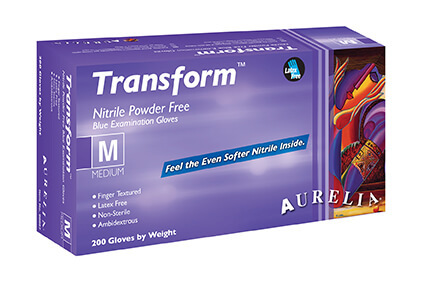 Aurelia® Transform™ evolutionary nitrile exam gloves will transform the way you feel about nitrile! Lightweight durable, sleek with a superior grip. The next generation nitrile gloves which feel as great as latex only attainable from Aurelia. Aurelia® Transform™ stretch nitrile powder free examination gloves are made from 100% nitrile, ambidextrous, indigo colour and non-sterile. Each batch of gloves is air-tested to detect pinholes. Fingertip-textured finish for precise gripping.